Butter muffin tins or use paper muffin cup liners. Sift flour with cocoa, baking powder and salt. Gently melt the milk with the butter. Beat eggs and sugar with a mixer until fluffy. Add flour mixture, milk mixture and vanilla. Beat at medium speed until smooth. Bake for 18 minutes or until cupcakes spring back when touched lightly in center. Cool cupcakes in pan on a wire rack 10 minutes; remove from pan, and cool completely. Inspired by: Weight Watchers Easy Weeknight Favorites. 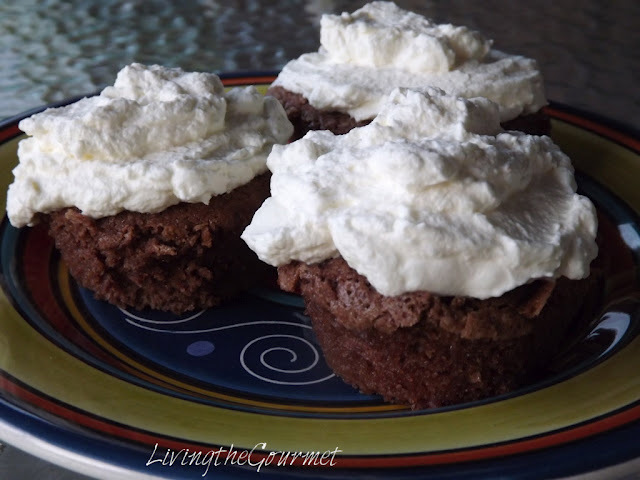 Serve plain or with fresh whipped cream and enjoy! These cupcakes are light and delicious.